Elected officials from Florida and Ohio were given tours this week of rail companies operating within their respective states. The events also included public policy discussions surrounding the recent positive train control deadline extension, as well as efforts to extend the shortline tax credit. 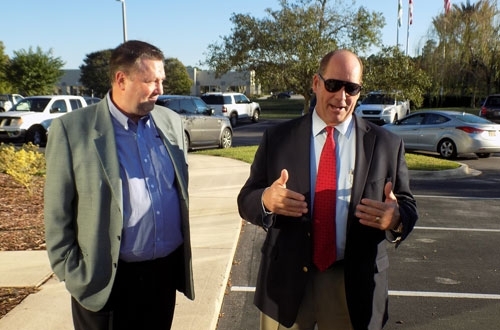 On November 12, Railway Engineering-Maintenance Suppliers Association (REMSA) member Balfour Beatty Rail hosted Rep. Ted Yoho (R-FL-3) for a tour of its Fleming Island, Fla., facility. 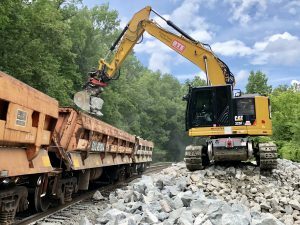 Balfour Beatty Rail, a division of Balfour Beatty Infrastructure, headquartered in Atlanta, Ga., specializes in construction and maintenance services for public and private railroad markets. 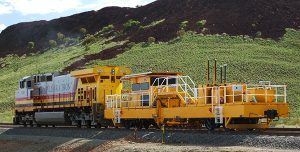 Its services include design, signal, ac & dc traction power, catenary systems, track construction and maintenance services. The group touched on two important rail issues Congress recently addressed: extending the Positive Train Control implementation deadline from 2015 to 2018, with possible case-by-case extensions to 2020 and Senate confirmation of Sarah Feinberg as Administrator of Federal Railroad Administration. However, there is still work to be done as Congress has yet to act on extending the Short Line Tax Credit, which allows Florida’s 12 shortline railroads to invest and improve their infrastructure and is set to go to conference on a long-term transportation bill. Rep. Yoho is a co-sponsor of House bill H.R. 721, which extends the credit. Additionally, on November 9, U.S. Rep. Bob Gibbs (R-OH-07) toured the R. J. Corman Railroad Company’s Cleveland Line (RJCL) railroad and R. J. Corman Material Sales Dover Yard. RJCL, a 55-mile shortline railroad, runs between Warwick and Uhrichsville, Ohio, passing through the towns of Massillon, Dover and New Philadelphia. The line interchanges with the Wheeling and Lake Erie Railroad, CSX and Norfolk Southern. The RJCL also includes the Wooster Line that interchanges with Norfolk Southern. Altogether, RJCL hauls corn, corn oil, sunflower oil, pulpboard, railroad materials, plastic, steel pipe, chemicals, scrap metal and sand. The tour commenced with breakfast and a safety briefing at RJCL’s Dover Yard, as well as introductions from three of RJCL’s customers – Dover Chemical, Frito Lay and RSL Railroad. The group discussed R. J. Corman Material Sales business, RJCL’s current operations, commodities, impact on customers and the ways RJCL develops creative solutions to better serve them. The discussion highlighted upgrades to the line that were made possible by the 45G tax credit, including the installation of 8,000 new wood crossties this year. Rep. Gibbs toured a short stretch of the railroad in a locomotive, which took the group to RJCL’s customer, Dover Chemical, and back. Afterwards, Rep. Gibbs boarded a helicopter, which provided the group a bird’s eye view of the railroad. Top: Mark Snailham with Balfour Beatty, left, and Rep. Yoho. Bottom: Left to right, Bill Newsome, R. J. Corman Material Sales; Susan Grasse, Pepsi/Frito Lay; Ashley Bosch, Chambers, Conlon & Hartwell, LLC on behalf of the ASLRRA; Congressman Bob Gibbs; Stark County Commissioner Richard Regula, Dave DePietro, RSL Railroad; Scott Weaver, R. J. Corman Railroad Company; Steve DePietro, RSL Railroad; and Laura McNichol, R. J. Corman Railroad Group.